So I'm finally creating the time/space in my life to take a stab at joining in with Sian and the Mondayers! Hello! I just completed a 28 day challenge based on the book The Fast Metabolism Diet - which required changing your allowed list of food every 2-3 days. Having found it confusing and difficult to get into the flow, I was looking for a new challenge that would continue the healthier food choices but would be simpler to follow. The concepts are very similar. The biggest differences - the FMD allowed certain carbs (oats, brown rice) two days a week but limited healthy fats (oils, avocado, nuts, seeds) to three days a week. The Whole 30 eliminates ALL grains including the "pseudo" grains like quinoa and all legumes, but allows healthy fats every day. Both eliminate wheat, dairy, soy, sugar, alcohol, and corn. So I'll be starting the Whole 30 tomorrow (took a couple of days off because I haven't yet done my meal planning and grocery shopping for the week). I'll have to come back after trying a recipe or two and let you know what I think! 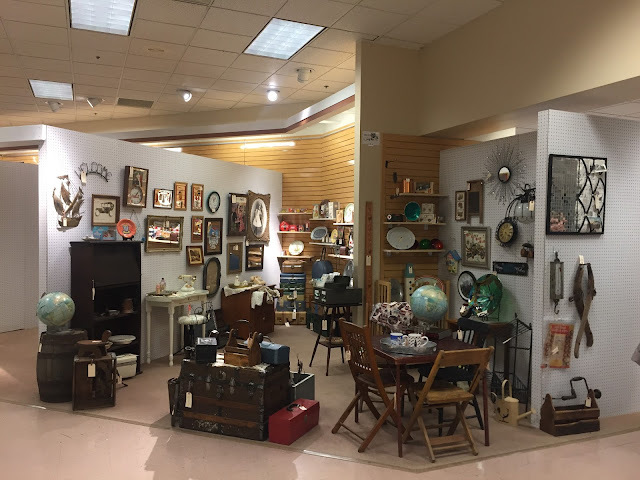 We were really just hitting our stride at Black Rose and making rent most months when, with less than two weeks notice, the management told us the Black Rose store in Allentown was closing and we needed to have everything moved out by the end of May. They promised us that a new store would be opening in Phillipsburg N.J. with a target date of late July. But we didn't want to have to put all that stuff in storage, nor bring it home... which led to a frantic search to find a new home. Which we did. So this was the space we moved into at Quaker. This is what the booth looked like in October after we were well settled in (in fact, starting to bring in Christmas items). The space is long but narrow enough that you can't create two aisles. The only way to use the space is to pile things against all the walls and leave the center open for people to come in. 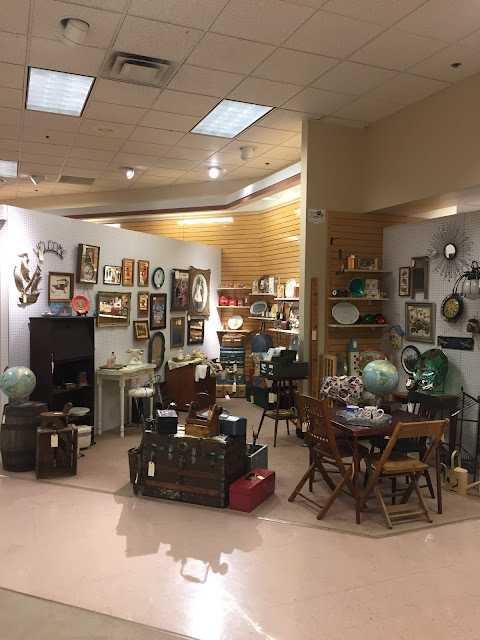 It was when we were in the process of moving in that we quickly realized that the space simply wasn't large enough for all the STUFF we had moved out of Black Rose. So we added a second smaller booth at Quaker - shown below. A teeny tiny corner booth with a lot of visibility that we affectionately called "guy land" as most of the stuff that ended up in this section was tools, tool boxes, lanterns, cars, and well.... guy stuff. We had both booths from June 1, 2016 until last weekend. In mid-December we finally got word that Black Rose was opening up in their new location in Phillipsburg N.J. - with an opening date of January 1, 2017. Coming in before the store was even open to the public had its advantages. We were able to scout a booth that is right on the main aisle between the front door and the back door of the store. And although this one is oddly shaped, it has a LOT of wall space for hanging items. And is fairly well lit and has very highly ceilings, providing a more open feel. On the down side, this location is a 50 minute drive from home, so it is not possible to check status more than once a week. 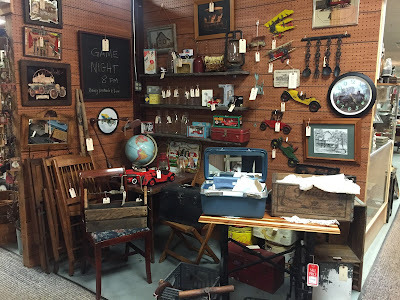 It took us no time at all to get to the point where it is already over stuffed and we are hoping for some big sales to move items out and thin the inventory a bit. Last weekend we moved the last items out of guy land and ended our lease on the smaller space at Quaker Antique Mall, retaining the larger space there, in addition to our new space at Black Rose. And that is how I have come to have not one, but two shops, in two very different locations. With apparently very different clientele. Stuff we had FOREVER at Quaker has sold quickly at Black Rose. Other things seem to sit at both locations. 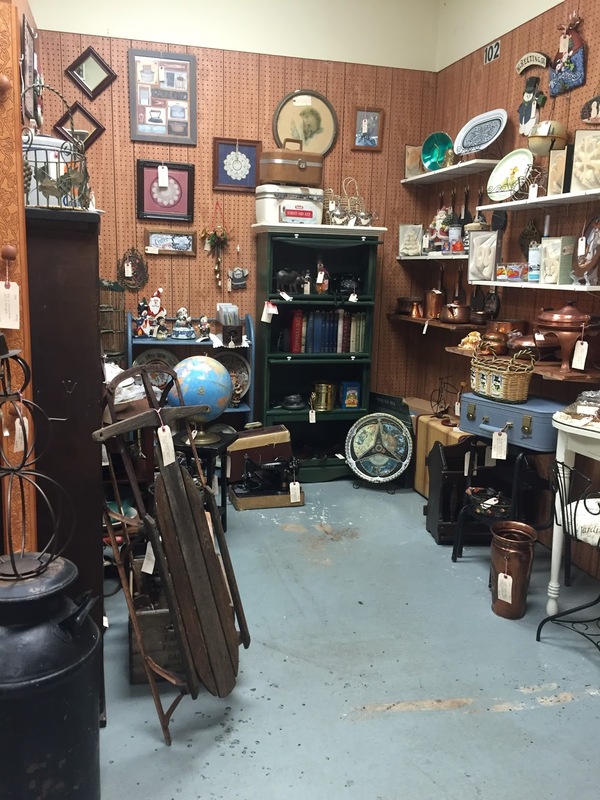 We'll be moving items back and forth between the two stores until we learn what sells best where. We are also navigating two very different sets of "rules" - one store provides no reports, pays out once a month, and charges a commission on top of rent - the other provides a daily email of items sold, pays out twice a month, and doesn't charge commission, but does charge for credit card sales. So we have to determine if one or the other is particularly more profitable or if it is all just a wash and we're happy in both locations. Either way, when flea market season opens again in April, we'll have a much better handle on the type of items to look for - no longer novices in the business! I loved reading your behind the scenes post. And I'd love a browse round your beautifully curated spaces in real life. I'm sure I'd find something (or more) that I'd be happy to bring home. It sounds like you are working hard..and loving it! Best of luck for the season ahead. You certainly have been busy behind the scenes! Interesting to see what the shops look like, very different to how I imagined them, over here the local antique shops are housed in converted railway arches! I remember well when you first talked about getting started with this---long before any stores were in the offing. I'm amazed at what you've accomplished since then, and would love a walk through the booths in both locations, although I'm quite sure Tracy would balk at my bringing anything home. For the first time, he's into purging, and making good progress on his side of the basement. I borrowed Whole 30 from the library, but it was too restrictive for us. I'm looking forward to hearing what you think. ALWAYS happy to see a post from you pop up in my Feedly! Congratulations, bu I still can't wrap my head around how you manage all this and still have any "me" time whatsoever. There must be more hours in your day than there is in mine! Everything looks great and really professional. 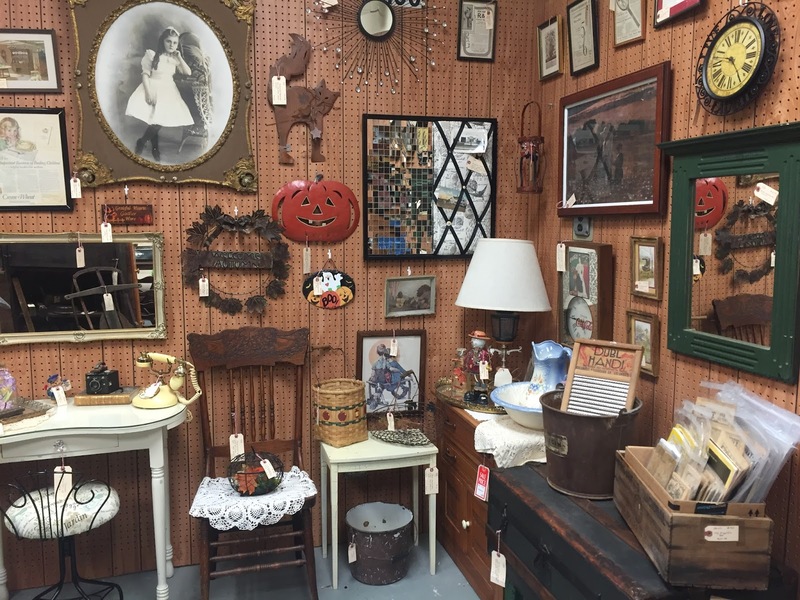 You could be transported to Frisco Mercantile and fit right in. I hope it gives you some fun and entertainment, as well as being another source of income. So glad to see you back on the blog site again! I enjoyed that little tour around your shops. Would love to have a rummage for real. Very interested in your dietary changes. Hope you'll have some time in future to blog about that. I've been making a few of my own but haven't settled on anything that seems quite right for me yet. Your booths look fantastic!! It's certainly been a journey, but it seems like y'all are doing well. Looking forward to seeing how sales go in the spring at both locations. Wow, you have been busy! That must have been a lot of work to first move the shop and then merge the shops. 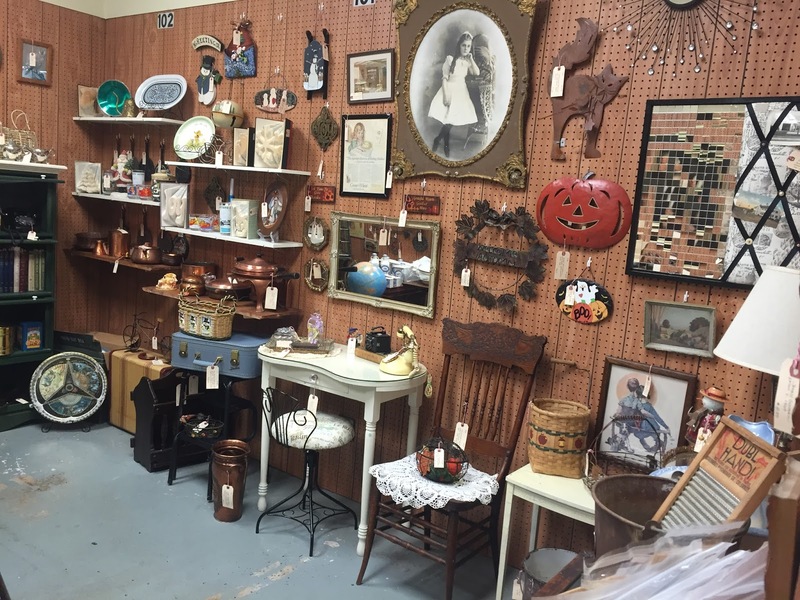 Do you actually have to be there to sell your "stuff"? Or is that done by someone else? I'm not sure I understand the concept completely. Interesting books about food. I don't think I'm cut out for following any of those diets - I don't really believe in cutting out entire food groups unless for allergy reasons. Not eating any grains? That means no bread, and I love hearty, whole grain bread (we Germans thrive on bread) and also bake it myself. I do understand how important it is to significantly lower sugar - and how difficult. That is a challenge for me, but one I am taking on.